Murray Karn began his comics career at only 18 years old, though this was not uncommon for many of the staff at Bell Features. Karn worked on ‘Thunderfist’ and Jeff Waring and was the most consistent artist for both of these series. To this day, these titles are most closely associated with Murray Karn and his artistic style. \Like most superheroes at the time, Thunderfist battled the Axis in order to raise the spirits of its young, wartime readers. Thunderfist himself is reminiscent of a Flash-like character, but is enhanced by technology that allows him super strength and the ability to fly. It was because of his good work on this series that he was given his own title to create which was Jeff Waring, the Amazonian adventurer. Karn’s talent as an artist was among the best at Bell Features. 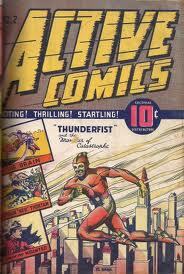 He was also given several covers for Active Comics. He continued to work regularly for Bell Features for the next two years as artist on these and other lines including Captain Red Thorton, Rex Baxter and Scotty MacDonald. He even contributed artwork to the narrative shorts in Triumph Comics, all under Bell Features. Karn did not live out the Canadian Comics Golden Age in Canada. Eventually he went into the Medical Corps but continued cartooning for the wounded troops to raise their spirits. But, when he returned, he was easily rehired even if only for a short time before the end of the Golden Age. He was at least able to finish the last two issues on Jeff Waring. Shortly after, Karn went to New York, Cleveland and Chicago to pursue opportunities in advertising. To this day he credits his years in comics for his success. Murray Karn currently resides in New York and is a part of the Southampton Artists Society.